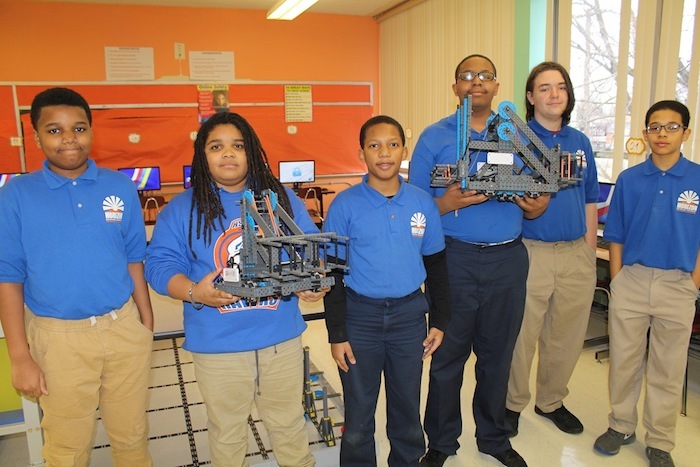 Horizon Science Academy Youngstown Young Hawks robotics team competed at the VEX IQ Robotics state competition in Marion. Team B earned the highest score in the state, which qualified the team to compete in the 2018 VEX World Championship that will take place Sunday in Louisville, Ky. There will be more than 400 teams competing from around the world, including China, Canada, Chile and others. The competition tasks the students with using STEM skills by designing and building a robot to play against other teams in a game-based engineering challenge. Team members above, from left are Cahmani Davis, Marcus Carbon, Kewon Allen, Travis Jackson, Solomon Kennedy and Joshua Ortiz. The HSAY robotics team is coached by Isa Ozbey.